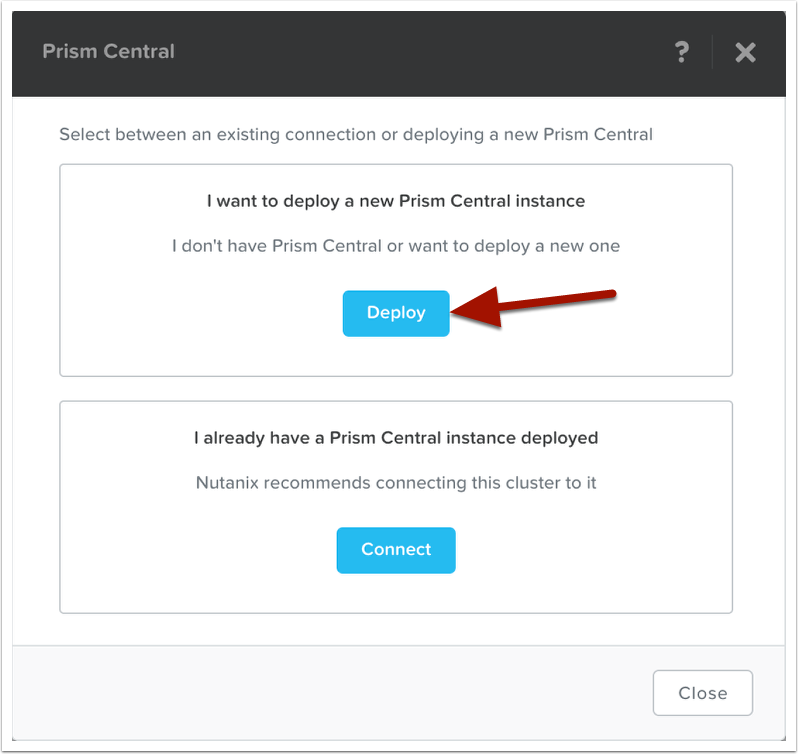 This article will show you how to deploy Prism Central (PC) on a Nutanix cluster running AOS 5.5 using the One-Click Prism Central deployment wizard. From within Prism Element (Prism for the cluster), click on the "Register or create new" option under the Prism Central widget, located on the Home screen. In the wizard that starts, click on "Deploy" under "I want to deploy a new Prism Central Instance". On the next screen, a list of deployable versions should be listed. Choose the latest version to install from the list (1). 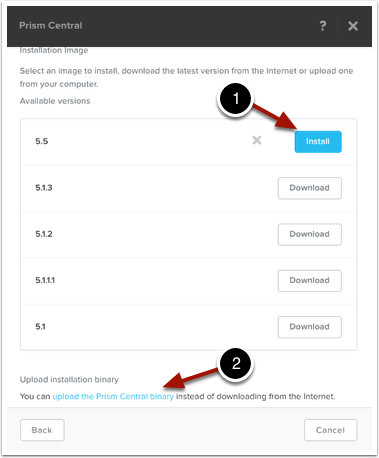 If the current version isn’t listed, compared to what is on the customer portal at https://portal.nutanix.com, use the "Upload the Prism Central Binary" blue link (2) to upload the latest version downloaded from the portal. The wizard will need some inputs from you to deploy a new instance. Fill out the Virtual Machine name for the Prism Central instance (1). 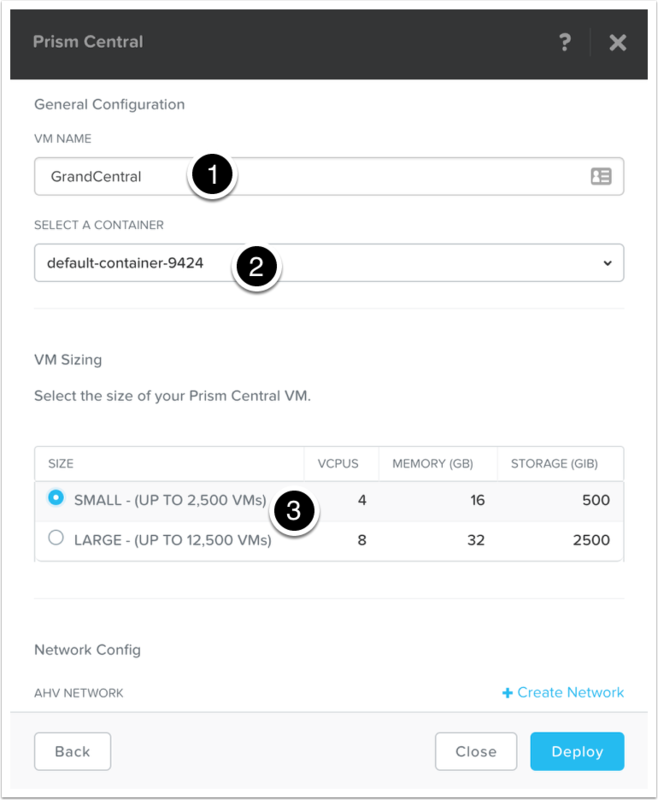 Select a storage container to deploy the Virtual Machine onto (2). 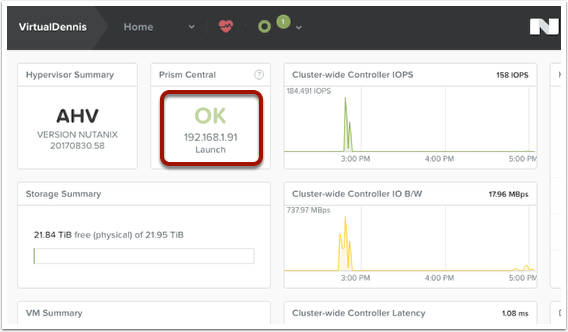 Next, choose the deployed size of the Prism Central VM instance (3). Choose the network that the Prism Central VM will be attached to (1). 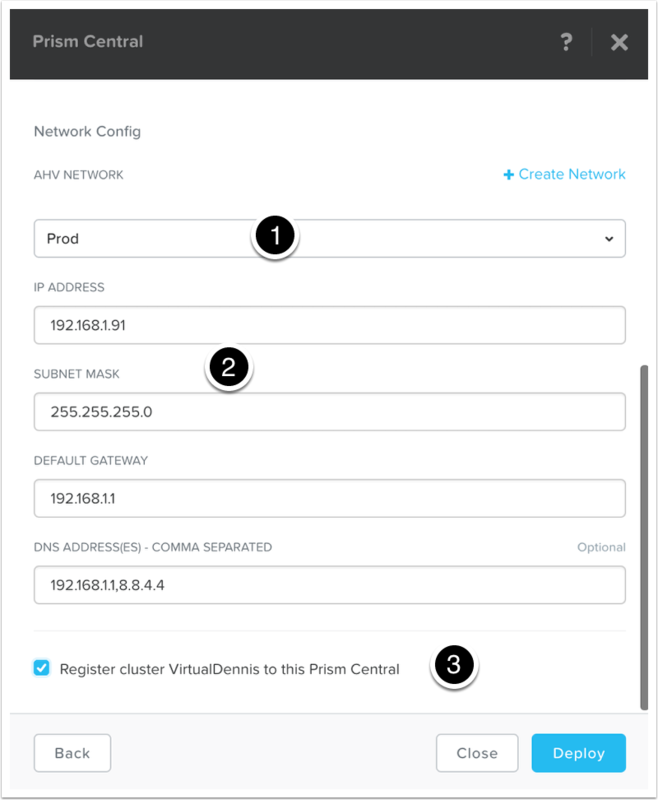 Fill out the IP address and network information that will be used for the Prism Central instance (2). Finally, select the checkmark box to register this cluster with the newly created Prism Central instance (3). Several tasks will start, which you can monitor from the blue circle that will appear at the top of Prism. Click on this blue circle to view the current tasks that are running. To get more detail, click on the "View All Tasks" link. Once the deploy tasks are completed, the tasks will turn "green" and will be 100% completed. To launch Prism Central, click on the "Launch" option under the Prism Central widget on the Home screen. Alternatively, you can also browse directly to the IP address shown. 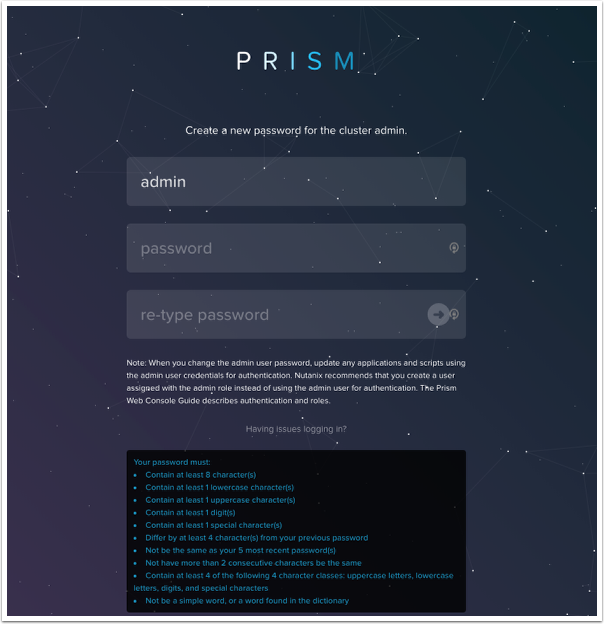 Now you are ready to log into Prism Central. You will be prompted to change the password on the first login. 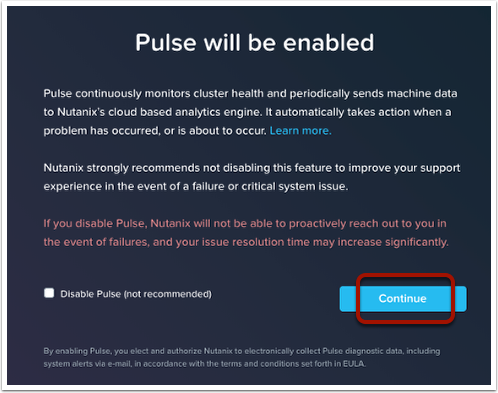 Nutanix clusters use our "Pulse" feature to create a SSL tunnel back to our support organization for phone home alerts and performance metadata. This enables us to proactively reach out to you in case of hardware issues or other cluster related alerts that need to be diagnosed. Click on the "Continue" button to leave Pulse enabled. You now have Prism Central successfully deployed! 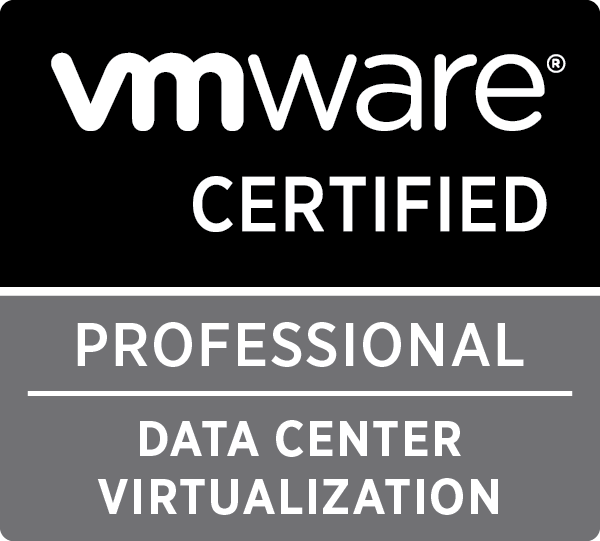 This entry was posted in Manuals & How-To's, Nutanix on December 12, 2017 by virtualdennis.